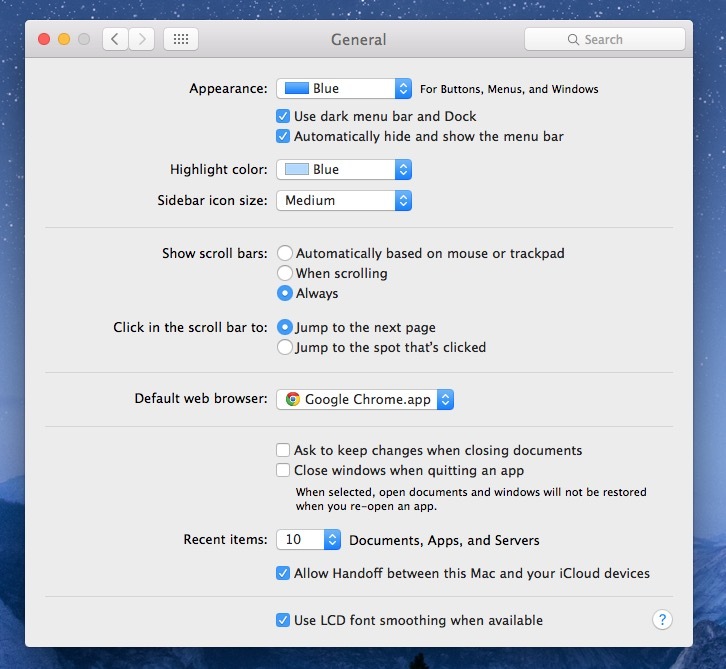 New versions of OS X allow Mac users to hide and show the menu bar at the top of the screen automatically, much like the Dock can be hidden and shown with a mouse over. Auto-hiding the menu bar is a nice feature for Mac users who are fans of minimalist desktop appearances, as it really eliminates just about everything visible on the screen aside from whatever the applications and windows are actively open on the display. When the menu bar is hidden, a quick mouse hover to the top of the display will reveal the menu bar, just like the same action makes the Mac Dock appear if it’s hidden too (which is also a great tip). Personally I like the menu bar being visible all the time, primarily for ease of access but also to see the clock, battery, and wi-fi status icons. Nonetheless, many users will enjoy hiding the menu bar as it really does eliminate distractions, and it’ll free up a few more pixels at the top of any Mac display if you’re feeling particularly cramped with space. You can obviously change this back to the default setting at any time by returning to the preference panel and unchecking the box for “Automatically hide and show the menu bar” again. If you’re looking for the menu bar to just be less distracting, another option is to switch it to dark mode which will display as black rather than white. You may need to log out and back in or kill SystemUIServer for the change to take effect in some cases. By the way, if you’re not on El Capitan 10.11 or newer, you can still hide and show the menu bar with this trick, which works all the way back to Snow Leopard, but requires the usage of a third party tool. Is there a Terminal command to remove the delay for the Menu bar like there is for the Dock? Be careful using this, I don’t think it should have even been released. Ever since toggling it on and realizing I didn’t need it, my Safari opens to small. By that I mean that the Safari window is now short by the amount of the Menu bar. I’ve tried multiple ways to reset the default opening behavior, and sometimes it works, but it doesn’t stick and eventually returns to this buggy behavior. I searched all over the place and ran across one article back during the beta testing of El Cap that someone described this bug, but it looks like it went without notice through Apples QC. I have just purchased a new MacBook pro with the latest El Capitan version and when I go to my General page I don’t have the option as listed in the article. Why is this missing? THANK YOU SO MUCH. Have been looking on how to fix my hovering menu bar for months now. Finally it is fixed.